Introduced in 1972-73, this was one of three 62-foot long box cars in the TYCO line. Oddly, TYCO only offered this car in two roadnames, both of which were fairly prototypical! The car disappears after the 1975-76 catalog, however like many TYCO items, this model remained available on dealer shelves for some time after. Letter designations following the model number (356) arrive in the 1975-76 catalog for both names. For example, adding an “B” makes No. 356-B the Soo Line car. The original retail price given in the 1972-73 catalog is $3.50, the price drops to $2.50 in 1975-76 listings. The model weighs 4.45 ounces and measures 62 scale feet to the ends of the shell. The model stands 17 scale feet over the rails. The plug doors are each 10 scale feet wide. A brief mention and small black-and-white photo of the Union Pacific and Soo Line cars may be found on page 18 of the July 1972 edition of Railroad Model Craftsman magazine. 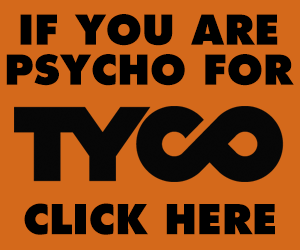 This announcement appears in reference to the publication of the TYCO 1972-73 product catalog, no doubt first presented at the hobby trade show of 1972. Around the year 2000, IHC Hobby re-issued this 62-foot Hi-Cube Box Car in its product line with a variety of roadnames. The car is cast from the former TYCO molds. 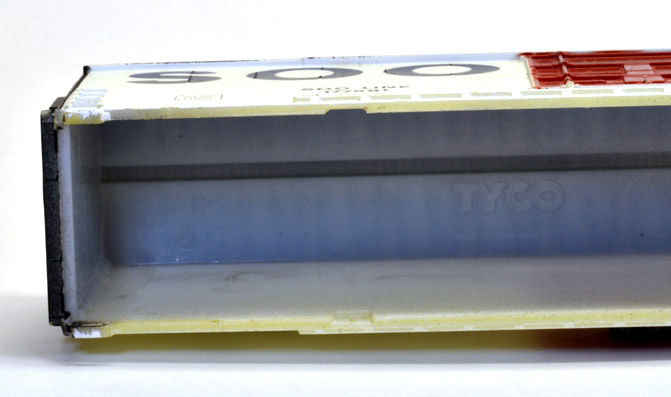 In fact, careful inspection of the underframe shows a smoothed over area where the TYCO logo once resided.